Many mistakenly believe that resilience is about grit – “toughing it out” or “persevering through hardship.” Many talk about the need for a growth mindset in order to overcome adversity. Mindset is important but CANNOT be accessed in the absence of nervous system regulation. Fortunately, a new paradigm supported by research is emerging about what constitutes resilience. Resilience is about the nervous system – the body’s stress response and its ability to remain in a healthy range of arousal and settling without getting stuck in an over or under-activated state. Author Linda Graham writes, “The Autonomic Nervous System is central to resilience because it keeps us in a ‘window of tolerance. The window of tolerance is a zone where our nervous system is relaxed, calm, alert, engaged. When we are in our window of tolerance, which we hope is most of the time, we feel centered and balanced. Everything is humming along in equilibrium. When we are in our window of tolerance, we can perceive-process-respond to life events with a kind of wise equanimity. We can cope. We can be resilient (http://loveandlifetoolbox.com/the-neuroscience-of-resilience-nervous-system-regulation/).” In this unique, one of kind workshop, participants will become “re-embodied” to strengthen their resilience which may be depleted from an abundance of stress and a history of trauma. Whether professionally or personally, caring for others takes a toll on us. In order to reinstate balance, we need opportunities for self-regulation, self-awareness, and self-care. In this interactive event led by four practitioners (Emily Read Daniels, Stefan Laeng Gilliatt, Rose Carey, Rick Simpson), participants engage in discussion, reflection, and guided practice to intentionally locate stress response and settle it – thereby reconstituting resilience. During these two days, participants will increase self-awareness and relational connection through practices such as sensory awareness, somatic experiencing,™ sacred healing, and primal health coaching. Individuals will experience the present moment with self and others in a truly unique way through breathe, movement, touch, and self-reflection. 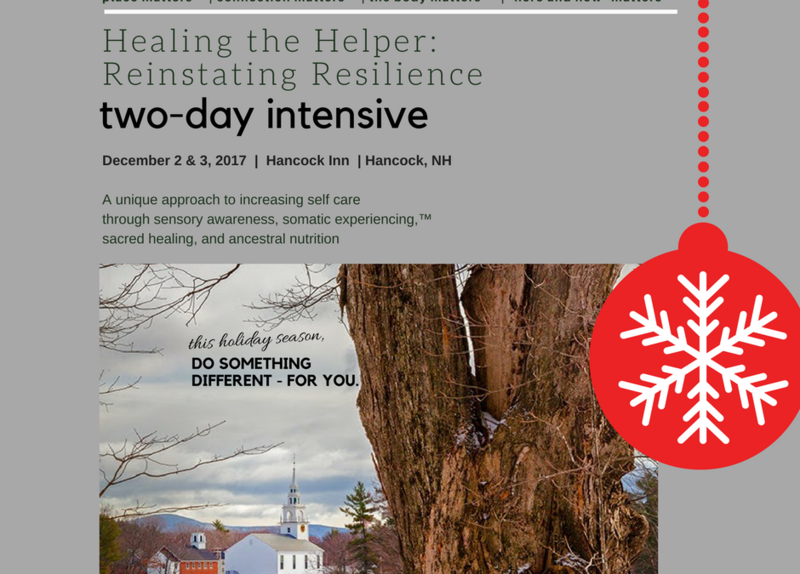 Intentionally offered in the bucolic village of Hancock, NH, participants will complete the two days with enhanced self-awareness, relational connection, and tools for self care.